T-Shirts - We have t-shirts of all sizes (S, M, L, XL, XXL). This years stock are all black with the new SwinGallery logo as seen to the left. Standard t-shirts are only $10 each. If you want to get your name on the back as we have done, it's only an additional $5 and we will take the shirts and have the name inscribed for you. 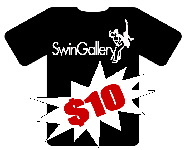 You can buy the shirts at any SwinGallery event or at most CincySwing events in and around the city. Supplies are limited and we are down to about our last 50 so buy them soon! If you are not at the SwinGallery that often and want a shirt just send your order in here [buy t-shirt] and we will mail the shirt directly to you after payment. Water Bottles - We are selling BPA free water bottles for everyone to use and recycle. Our SwinGallery water bottles are only $1.00 each and we encourage everyone to buy and use them and help advertise our Thursday night venue! If you are not at the SwinGallery that often and want a water bottle for your personal use, just order one here [buy water bottle] and we will mail the bottle to you directly to you after payment. The are actually shorter than this stock photo and have black lids and they are cool!